Before you make any changes to your processes, it’s crucial to know how your performance compares to your peers. The content in this section includes both measurement process and principles -- why measure, what to measure and how to measure – as well as our latest data. The first step in making the business case for any improvement is measuring current performance and gauging how much of an improvement is realistic. 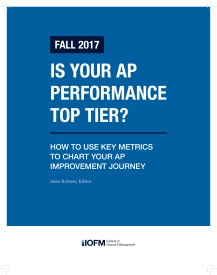 IOFM's latest benchmarking report enables you to compare your department to others AP functions with similar levels of automation and organizational structures.